The Department of Financial Services, Division of State Fire Marshal (hereinafter “Division”) is authorized by the provisions of Section 633.806, Florida Statutes, to conduct investigations with respect to the causes of firefighter employee injuries for the purpose of enhancing firefighter occupational safety and health in the State of Florida, and to make recommendations to the Legislature, firefighter employers, and insurers as to the best means of preventing firefighter injuries. The Division is authorized to impose penalties on any firefighter employer who violates or fails or refuses to comply with sections 633.801 through 633.821, Florida Statutes, the “Florida Firefighters Occupational Safety and Health Act.” (hereinafter “FFOSHA”), Rule 69A-62, Florida Administrative Code, (hereinafter “FAC”) and lawful orders of the Department of Financial Services (hereinafter “Department”) under FFOSHA. The scope of this investigation is to determine the cause of the firefighter death, whether violations of FFOSHA, rules relative thereto, or lawful orders occurred, and make recommendations to the firefighter employer as to the best means of preventing similar injuries in the future. The Bureau of Fire Standards and Training (hereinafter “Bureau”) was notified on November 27, 2007 by the Bureau of Fire and Arson Investigation that a Volusia County firefighter had been killed while participating in a special operations team drill . The Bureau of Fire and Arson Investigation responded immediately to photograph the scene and conduct initial fact finding. The Bureau notified the firefighter employer that it was conducting an investigation of the firefighter fatality. The relevant records required by FAC 69A-62.003, entitled, “Recordkeeping Responsibilities of Firefighter Employers” were requested and reviewed. All available fire department members who were present at the incident were interviewed. Personnel with leadership and oversight responsibility were also interviewed. Additional documentation was collected and reviewed. Based upon the foregoing investigation, the following description was developed. The Volusia County Fire Department (“fire department”) is located on the east coast of Central Florida. The fire department serves approximately 500,000 permanent residents, in a 1,207 square mile area with 47 miles of Atlantic shoreline. The fire department currently is staffed by 220 career firefighters in 24 stations, who serve 16 incorporated communities in addition to the unincorporated county area. The fire department is assisted by volunteer firefighters. The fire department’s special operations team for wildland fire operations called “Fire Walkers” (hereinto referred to as “the team”) was conducting its monthly drill, with 14 career team members in attendance, at the fire department’s training site. The drill consisted of a refresher course for qualified operators culminating with the felling of three dead trees, on the property. The trees were in excess of 40 feet in height and greater than 12 inches in diameter. The tree that was involved in this incident was the largest of the trees with a height in excess of 40 feet and a diameter of approximately 18”. According to all witnesses interviewed, the team began the training session around 0900 hours, with a classroom session where a video on Power Saw Safety was viewed and discussed. Some of the discussion centered on the need for, and design of, two escape routes away from the intended direction of tree fall. These routes were to be cut into the palmetto brush surrounding the trees. The video they were shown is part of the National Wildfire Coordinating Group (NWCG) S-212 Wildland Fire Chainsaws class that is designed to run four hours; this class lasted approximately 2 hours. This was the first training event for the victim and several other new members of the team. The Sawyer (chain saw operator) and the Swamper (the victim) assigned to cut and drop the assigned tree were both new members without any previous formal training in tree felling. Neither had completed the formal training class (S-212; Chainsaw Use, Maintenance and Safety) on chainsaws. A Swamper serves as a look-out for the Sawyer by watching the top of the tree and keeping the Sawyer advised as to which way the tree is beginning to lean, if the wind is increasing or diminishing, and any other forces influencing the fall of the tree. In this case, several other team members, including an instructor were assigned to the tree. The team followed procedures – selected a direction to drop the tree, cleared at least one escape route, and began chainsaw operations. 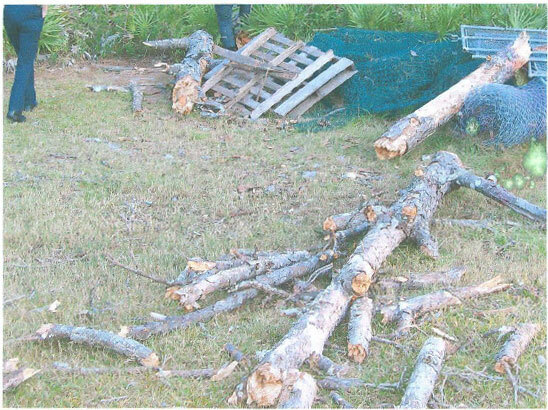 When the Sawyer began making his cuts to fell the tree, he and the victim were the only two people in close proximity to the tree. The cuts into the tree appear to have been made in such a manner that the tree had a “hang-point” rather than the “hinge” described in the video. This caused the tree to turn counter-clockwise as it began to fall, which caused the tree to move 135 degrees away from its intended fall. When the tree started its fall, the assigned instructor, who was already half way down the escape route , saw the direction the tree was falling, ran the rest of the way down the escape route (away from the tree base), later turning 90 degrees to the left to get out of the tree’s way. The victim left the Sawyer at the base of the tree and ran down the designated escape route, which ended up being the direction of the tree’s fall, toward the instructor. At this point the tree was to the victim’s back. As the victim reached the end of the escape route he was struck by the tree trunk and killed. Had he stayed with the “Sawyer” he most likely would not have been injured. Although it was stated there were two means of emergency egress from the tree, our team could only identify one, that taken by the victim, which was in the direct line of the tree's final fall. While there was a second escape route, it was not clearly visible. Inexperienced and untrained trainees were placed in positions they were not prepared to perform; they were not trained "commensurate to duty" as defined in FAC 69A-62.0001(7). There was no one at the tree to assess the quality and accuracy of the Sawyers cuts, assure the safety of Sawyer and Swamper, or prevent the victim from running down the escape route to his death. There was no lesson plan, no schematic of the area with placement of trees and escape routes, no real designation of responsibilities, and lack of an operational overseer. FS 633.807 Safety: firefighter employer responsibilities.- "Every firefighter employer shall furnish and use safety devices and safeguards, adopt and use methods and processes reasonably adequate to render such an employment and place of employment safe, and do every other thing reasonably necessary to protect the lives, health, and safety of such firefighter employees." A place of safe employment was not adequately provided to the victim. The instructor was not at a location where he could effectively signal, stop, or mitigate the event. Safety was further imperiled by the fact that both the Sawyer and the Swamper were not adequately trained for the task undertaken. (a) Training by supervisors or trained instructors, of new firefighter employees and firefighter employees transferring to new jobs, on the operating procedures of vehicles and equipment to be utilized by the firefighter employee." (m) Training. Each firefighter employer shall provide training and education for all firefighters and supervisory personnel commensurate with those duties and functions that such firefighters and supervisory personnel are expected to perform. Such training and education shall be provided to firefighters and supervisory personnel before they perform any emergency activities or other activities requiring such training. Supervisory personnel shall be provided with training and education which is more comprehensive than that provided to the general firefighters. This team did not utilize the entire training package created by the National Wildfire Coordinating Group (NWCG) and endorsed by the Department of Forestry. Instead, they presented a much shorter version including the video and a short discussion period. This operation was familiar and usual to the team but not to the new members. The experienced members supervising the new members were not prepared for an unusual circumstance with the fatal consequence. In order to benefit from packaged training programs one should experience the entire curriculum for the entire time intended. More time needs to be allocated to “what if” strategies to address all possible system failures. A key component to firefighter survival is conditioned response as demonstrated by the action of the instructor assigned to the tree. This condition had not been engrained into the victim and when faced with the unusual, the usual fight/flight survival instinct took over unintentionally placing the victim in the way of the falling tree. Corrective action: Provide documentation that all “Firewalker” personnel have completed course S212 in its entirety. The above corrective action contains a completion date. When the corrective action is completed, the fire department should send an email confirmation to the Safety Program Manager at firefightersafety@myfloridacfo.com, and a follow-up inspection will be conducted. Develop standard operating procedures for recertification of Fire Walkers stipulating regular drills only for those already trained. Develop instructor and safety training, focusing on the needs of students with diverse experience and training levels. Develop training and repeated awareness for all members that a safe environment can only be assumed when training, experience and supervision is based upon the unusual and unexpected occurring.